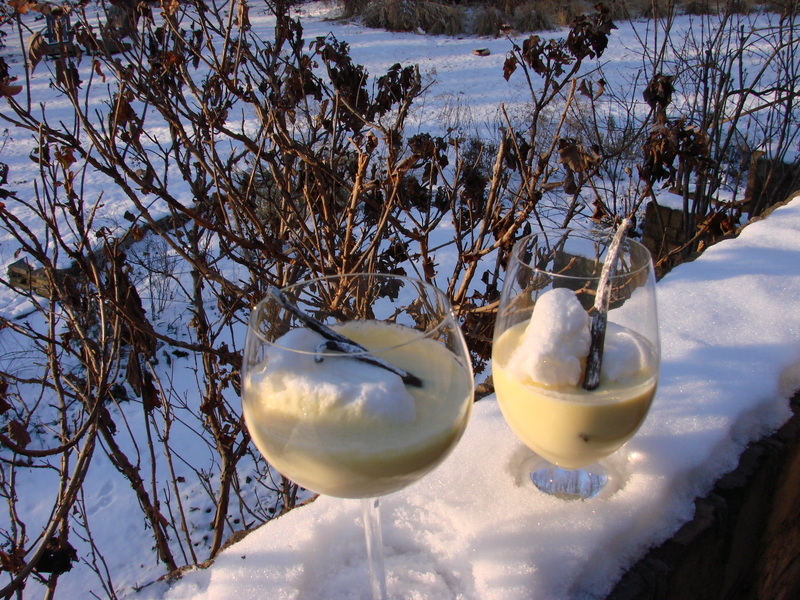 The Schnee Nockerl, (Snow Dumpling), as an Austrian dessert is called, is nothing more than a Meringue Dumpling. Here in America it is known as the Floating Island, and is absolutely my most favorite dessert. When I was about fourteen years old and we lived in our first home in Los Angeles I often started dinner after school, and before my mother came home from working at a near by hospital. Mother had weekend duty and on one of those days I wanted to make something special for the family as a dessert. I had talked with mother the night before about how to make Schnee Nockerln. We had no recipes at this time, because we came to this country as immigrants from a war torn Europe. With mother’s instructions I felt I could make this dessert on my own without her watching over me. I knew I had to bring the milk to a simmer before I spoon dropped the whisked egg whites into the hot milk. I looked for a pot and found an orange colored glass bowl, which had the inscription on the bottom reading “Firefast.” Not knowing the English language well at the time, I translated it to be “heat-proof” or being able to cook in it over fire. I poured the milk into this glass bowl and placed it over a very small flame while proceeding with whisking by hand the egg whites, sugar and a few drops of lemon juice to become a lovely meringue. While I was whisking the egg whites the milk slowly warmed and got to the simmering temperature. I watched the bubbles come up and a thin skin developing over the surface while the steam floated into thin air. I took a spoon and dropped the first Nockerl into the milk when this horrendous crack occurred and the bowl with the milk and the dumpling split open and spilled all over the stove and the kitchen floor. The bowl was not fireproof. It was not to be cooked in! I remember just staring at this mess, thinking that I will not have time enough to clean it all up before mother got home from work. Mother arrived and helped me clean up the kitchen, and together we finished cooking the rest of the dinner for the family. There was no dessert that evening. It took years before I attempted to make this dessert again. Actually I developed it as a recipe for one of my cooking classes here in Baltimore and made it often since. This is really a very easy dessert. 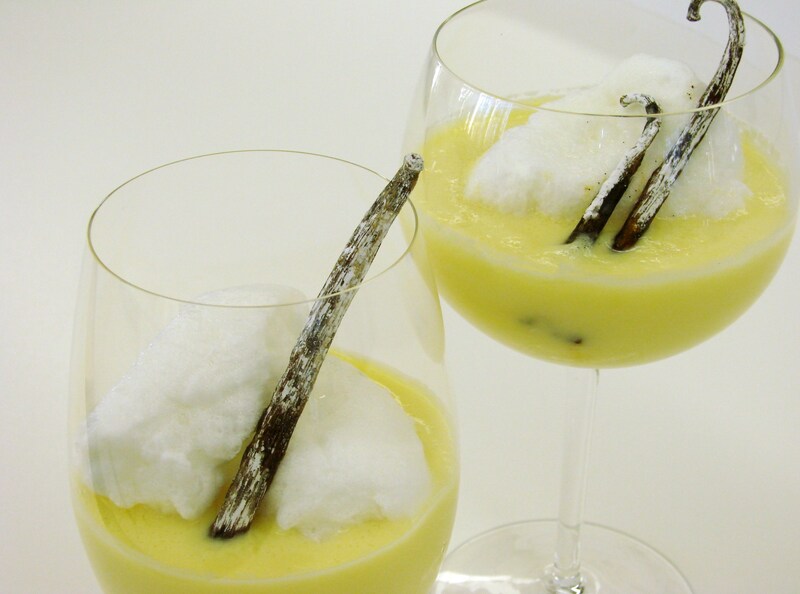 Floating Island in Vanilla Custard Cream. Set up a pot with simmering water. I use water instead of milk, because the milk tends to scorch on the bottom of the pan and flavors the milk unfavorably. and simmer them in the water. About 2 min. on each side. Drain them on a clean kitchen towel. The dumplings will get smaller when cooled. Prepare an ice bath…….place ice cubes into a bowl and set aside. 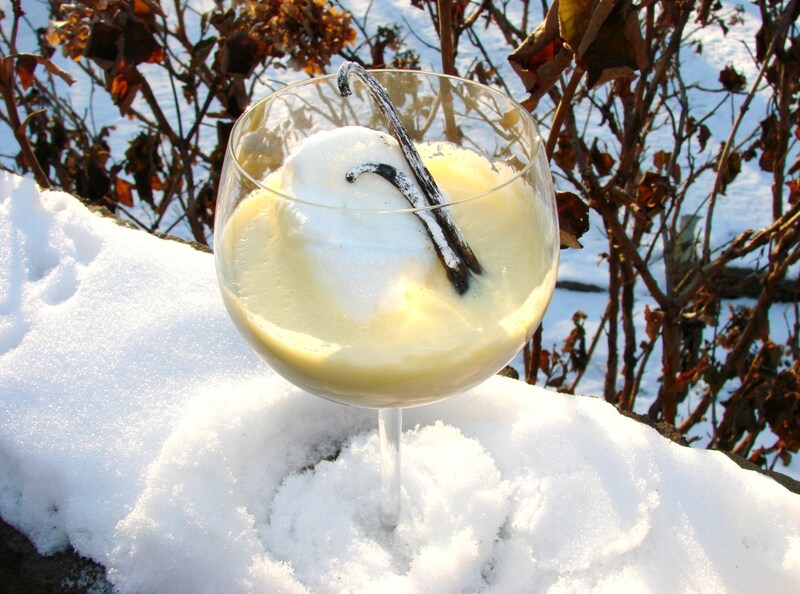 The ice cubes will melt a little by the time the cream is cooked……..then add a little water to cover the ice cubes. As soon as the custard is cooked transfer it to a clean metal bowl and place it into the ice bath…..
stir the cream to quickly affect cooling. Mix all three ingredients in a double boiler and cook slowly with constant stirring until it becomes a custard-like cream. Remove quickly from heat and pour it into a stainless steel bowl. Place bowl with custard into an ice bath and stir to cool. Flavor with a tsp of Vanilla Extract. 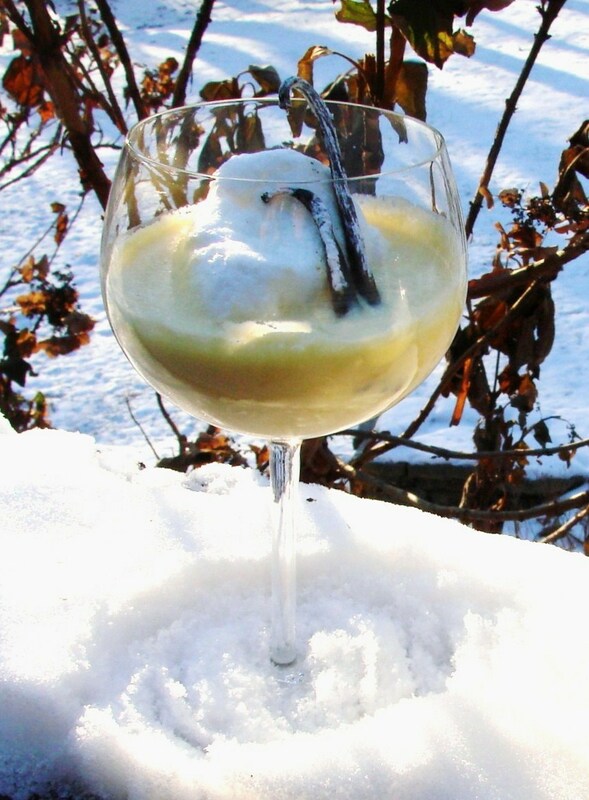 Serve the Custard cream cold in an attractive glass or bowl or an old fashioned champagne glass with the Schnee Nockerl, meringue dumpling floating on top. A little knowledge and being successful making Meringue! To whisk egg whites to it’s full potential here are some tips! What is Egg White foam? Beating egg whites creates air bubbles (gaseous phase) which are dispersed throughout the white (liquid phase). As beating continues, the air bubbles decrease in size and increase in number. The wonderfully elastic egg-white protein molecules unfold, stretch and join together, changing their shape to surround the air bubbles. The protein then begins to coagulate where the egg white meets the air and creates a network. This foam can be over beaten which dries and sets the foam. With this over-beaten foam, the bubbles are already set and can not further expand, so that the protein bonds break and the incorporated air escapes. At this point the foam looses volume. When the egg white foam is left to stand more than 5 minutes, it quickly returns to its liquid state as the bubbles break. 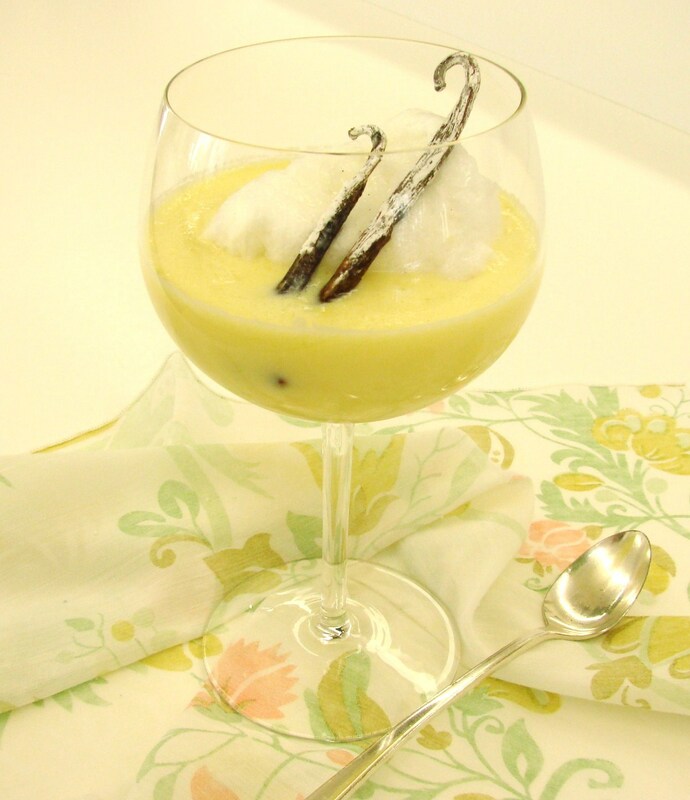 If the whisked whites contain sugar or an acid (Cream of Tartar), the foam is stabilized for a little longer. before separating them from the yolk. If the egg white is allowed to warm it reaches its greatest volume. The temperature needs to be just enough to take the chill off the egg…..luke warm. 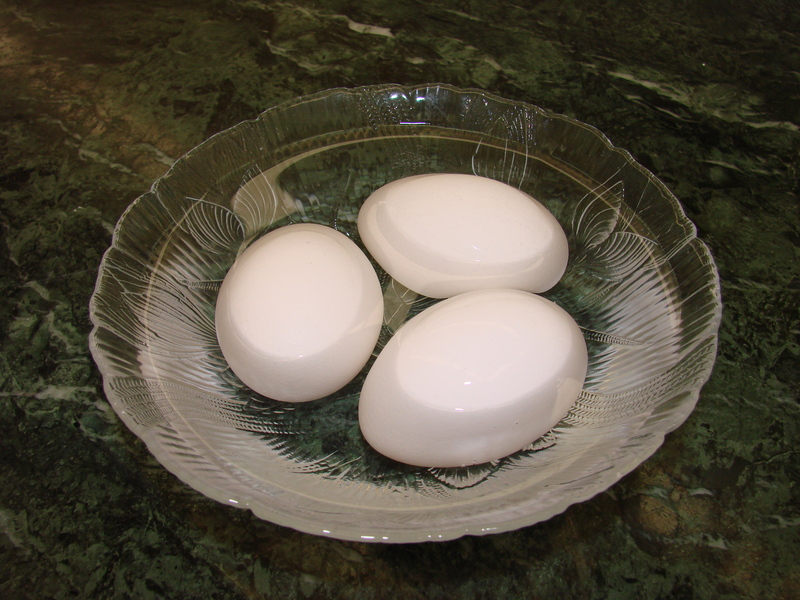 The warmed egg white has a reduced surface tension and therefore foams easier. Beating time is related to the temperature – the colder the egg white the longer the beating time. A very small drop of the yolk can lessen the volume of the foam, or can it? Always separate the egg into a small container first and then transfer to the mixing bowl – to assure no yolk is mixed into the egg white. 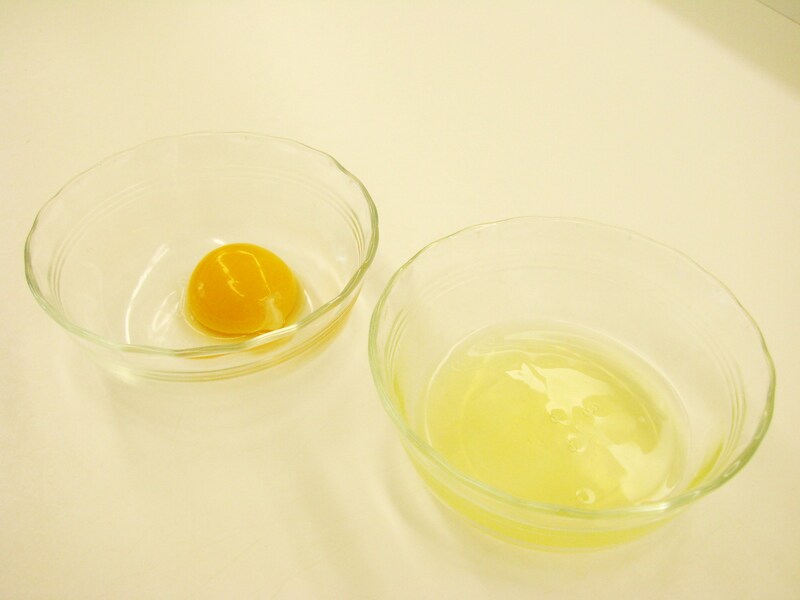 The egg yolk is a fat and all fats inhibit the foaming of the egg whites. The fat interferes with the coagulation of the protein. When fat joins some of the protein it prevents the bonding between them. Therefore it is necessary that the beater and bowls are very clean and are without a fat residue. It is best to use stainless steel or glass bowls. Plastic bowls tend to absorb and retain fat. My own experience with egg white foam is that a smidgen of egg yolk makes hardly a difference if your eggs are warmed in warm water before beating them. It is much more important to have your beater and bowls free of fat. Always add an acid to the egg whites to assure more volume. Acid ingredients help stabilize the foam by making it less prone to over-coagulation. Increasing the acidity of egg whites, makes it more difficult for the egg-white protein molecules to bond too tightly. This keeps the foam loose and elastic, and stable enough to hold the air cells and allow them to expand well when heated, resulting in better volume. The most common ingredient is Cream of Tartar, a mildly acidic salt made from grapes and containing tartaric acid. However, vinegar or lemon juice may also be added before beating, but is more difficult to use because their acidity varies. Shirley is a biochemist and has compiled her knowledge and experience about food and cooking from a scientific point of view, yet explains it is layman’s words. It took her 10 years to put this book together – it really is very good. I highly recommend it. Shirley is a delightful lady and a wonderful teacher. Is Meringue difficult to make? Did you have any mishaps making meringue in the past? How do you use meringue in your cooking and baking? I know that I’m probably missing out but I have trouble eating meringue or anything with a similar texture. I even have reservations about whipped cream. I did like your story about it though! Valerie…….I can understand your feelings about certain foods that have a consistency that just does not agree/appeal to us………. For years I could not eat cream of wheat or creamed spinach…..or anything else that was near that type of prepared food………. Thank you for liking my story…….. I first had this dessert in France when I was a student there many years ago. Friends of my parents had taken me out to a restaurant and told me to order anything. As a poor university student who lived on bread and cheese, I saw this as my opportunity to eat onion soup, frogs’ legs, snails–and a dessert with the lovely name of Ile Flottante. It is made the same way as yours, but with caramel swirled over the egg whites. Hi Cornelia…………all the way from Berlin, Germany! What an interesting story……I too have lived in Germany after college and know what a treat it was when I was taken out by friends of my family……just to spoil me – to restaurants where I could choose anything I wanted and not having to remember how much money I had in my pocket…….. I will have to do this the next time I make this lovely dessert. Thank you for your story that brought back memories for me as well…………..
What a lovely story Maria! I remember some disasters and that they do take a long time to recover from. After leaving home at 18 I had my mom to dinner one night and was cooking a meatloaf, somehow I locked myself out of the house and was consumed with trying to figure out how to get back in, forgetting all about the meatloaf in the oven. Eventually, as the meatloaf burned I became so worried about burning down the house that I broke a window to get back in! Didn’t make meatloaf for a long time after that. I got chills thinking about your dilemma of not being able to get into your house……and the meatloaf in the oven……….how frightening……….. Thank you for your nice comment……love it!!!!!!!!! Great info! Question though – I was always told to separate the eggs when they are cold, then let the yolks and whites warm to room temp. One of the magazines I get just did a package on meringues – they did the floating islands as well – was looking at those and thinking I might need to try this. Oh yeah – love the “disaster” story – I think we all have a few too many of those, but they do make great stories! Beautiful photography Maria! The disaster stories remind me of my days, right out of college, as a home economics teacher… without much cooking experience! Sue……..so nice to find a comment from you……..thank you! I think most of our “disaster” stories are when we were just starting out on our culinary path…….but, I still have them sometimes……..I never know what the stove and I have in common on a particular day…… The difference from before and now is that I know how to fix MOST of my mishaps at this stage in my life……..
Love your stories, thank you Maria. This is one of my favorite desserts. It was served to me in England last spring. I know this is cheating, using the packaged meringues, but it is deliciuos and oh so easy. I love the “cheating” recipe………it is so good to have them in a “quick to do” file………and your desserts are always the most marvelous…….one would never think that you ever “cheat” with them……….. This brings back memories of my Grandmother’s kitchen. She was famous for her merinque topped pies. She taught me how to separate eggs. I remember her making me use three bowls at first. One in which to deposit the yolks, one in which to put the egg white and a third bowl in which the “approved” yolk free white was to be placed to be beaten. Time consuming, yes, but foolproof. She always had perfect meringue. Thanks for jogging this memory. Your grandmother sounds a lot like mine….she too made me do every step separately in everything she taught me……….these grandmothers of the past……… jewels of the past……. do not exist any longer……. Children of today need things done fast with no interruptions….. It certainly is easier to write than Schneenockerl……….. Thank you for your wonderful comment!!!!!!!!!!!!! !